My Cats Are Democrats: Will The GOP Throw Trump The Hell Out? It's been five weeks since Donald Drumpf clinched the Republican nomination — and once again, we cats must observe the precious time and resources he's been wasting. But Drumpf is not wasting them as we assumed he would: sitting around Mar-A-Lago in his pajamas, getting his orange tan reapplied, and tweeting. No, he's doing something far more destructive than nothing. And we all know what that is, don't we? The last we looked, POLITICO had seven headlines about Drumpf's attack on US District Judge Gonzalo Curiel, the nation's newest famous Hoosier. And since Drumpf has doubled down on his racist broadside in a call with campaign surrogates, this story is now officially out of control. So we're wondering a few things. First, how quickly did Drumpf surrogates Jan Brewer, Pam Bondi and Scott Brown hang up from the conference call and frantically dial one another up, saying, "OMFG"? How soon will it be before one of them quits the campaign with a lame excuse? Second, how long is the RNC willing to devote scarce resources — organizational, fundraising, GOTV, campaign management — on Drumpf clean-up? Every day that Rancid Pieface and his minions have to reach out to conservative Hispanics to keep them on board, or talk to nervous moneybags who fear throwing good dollars after bad, is time ill spent for them. Finally, what are the chances that some Republican will have the guts to stand up and say, "Folks, we simply cannot nominate this man"? It's a long time until Cleveland. Things could happen. (We're thinking rule changes.) 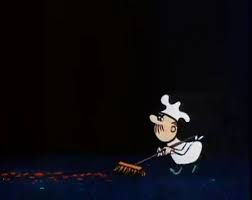 In the meantime, the GOP is looking a lot like the janitor from Peabody's Improbable History — except, in this case, sweeping up elephant dung. We cats PURR.